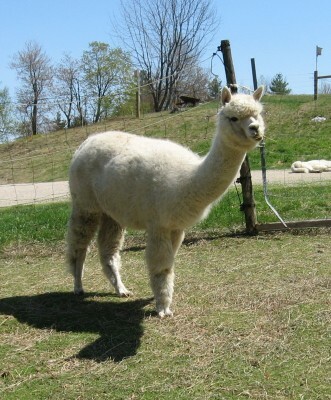 Our herd is composed of alpacas with heritage from all three South American countries. We have nearly all the colors they come in. 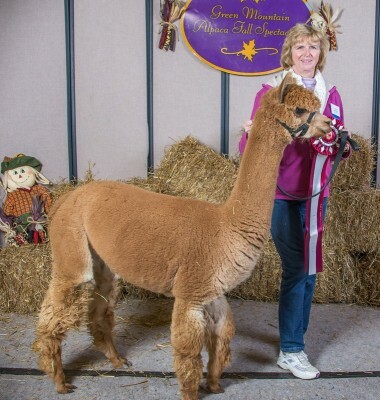 See our sales list at Foss Mountain Alpacas For Sale. Although we bred most of our girls in the early years, once we reached about 30 alpacas, we slowed down the breeding business and are now primarily a fiber farm business, producing fleeces for roving and yarn and selling finished alpaca products. 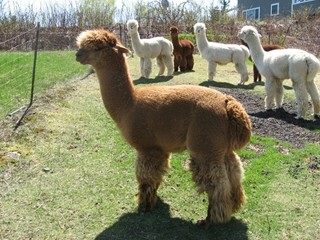 Some of the alpacas who make yarn for us are shown below. Pennies is an appaloosa and her few brown spots blend seamlessly with her beige base coat during processing at the mill to produce a creamy yarn. 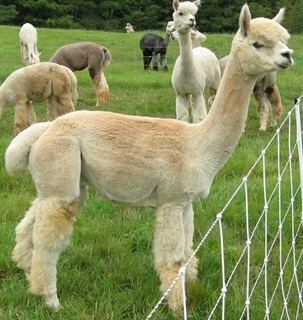 See pictures of our yarn on the ‘Alpaca Products’ page. Galaxy’s Cracklin Rosie – is she silver or rose??? 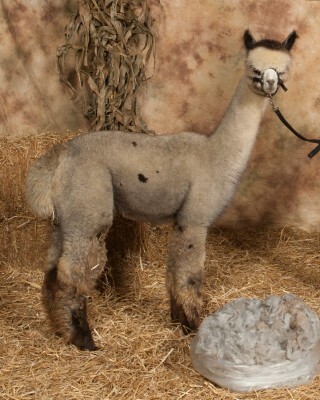 Cracklin with her blue ribbon fleece. Bright silver fleece! Cracklin’ is light silver grey, but shows some rose gray too. She has very beautiful, very fine silver fleece. 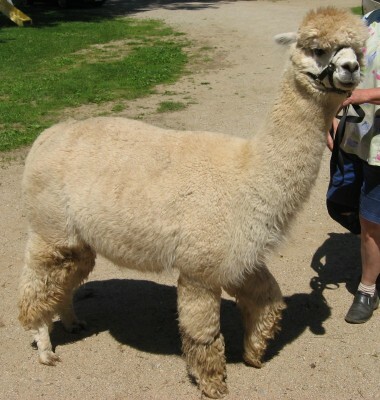 She is a sweetie, and is our go to girl for the demos with the llamas and alpacas at the Fryeburg Fair. She does the obstacles well! Her yarn certainly looks silver grey and is a great seller! Krypton with his ribbons. Rich black yarn came from that fleece. Krypton is a beautiful black Junior Herdsire . 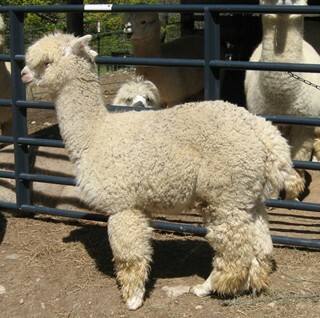 He is one of the last offspring from Snowmass Nova, with Snowmass Peruvian Casanova and Peruvian Bueno in his pedigree. 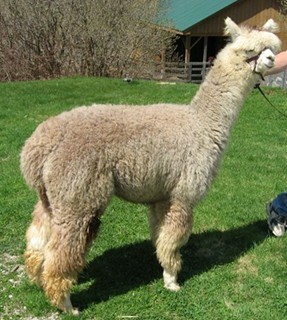 He has dense, crimpy black fiber and has placed in both halter and fleece shows. He got Reserve Champion in the Green Mountain Fall Spectacular fleece show! He is one of Snowmass Nova’s last sons and is a crimpy true black. 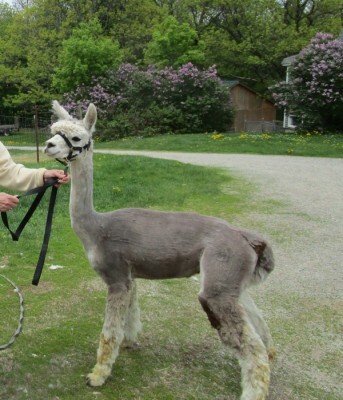 His fleece won first in the yearling class and reserve color champion out of all the ages at the Vermont Green Mtn Alpaca show in 2014. His yarn is a true black and because of his density, he makes lots of it. Gunny is a big beauty. His yarn mixed with Purple Rain is awesome. ‘Gunny’ is a beautiful rose gray boy, who with his half brother Purple Rain, produces some of our best-selling yarn. 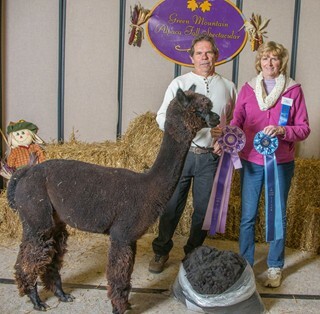 He won a third place ribbon in Vermont’s Green Mountain Fall Spectacular as a yearling. 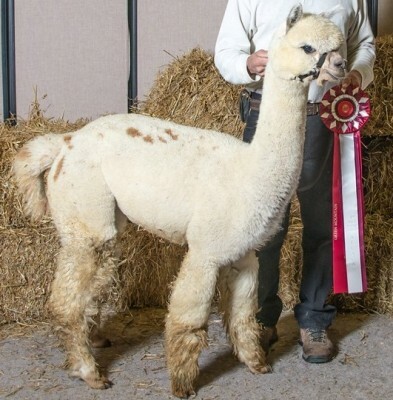 Also as a yearling, he won a second place ribbon in the New England Hands On fleece show. He also won a third place ribbon at the New England Classic halter show as a two year old. The judge liked his density and soft handle. Troubadour is big and beautiful and has passed on his wonderful spots to two of Queenie’s daughters, Pennies from Heaven and Athena. He and his daughters have awesome fleeces! As with Pennies, the brown spots blend with the light fawn base coat to produce a fawn yarn with very faint marbling. His fiber, as he has aged, as still remained fine enough for yarn. Due to it’s light color, his yarn can be dyed a variety of nice colors. Oh Sammy we miss you! Axel is a gorgeous vicuna marked fawn boy who, like his father, holds his ears back most of the time and doesn’t take ‘no crap’ from anyone. He is one of our best fiber boys and we often blend his yarn with other fleeces to make heathered yarn. Thanks to his sire Sammy, Axel continues to produce beautiful yarn year after year. Bonjo has the best of both of his parents. His dam, Cherry Bomb, gave him his heavy boning and his great density. His sire, Sammy, gave him his fineness and manly personality. He is our best white fiber boy. We leave some of his yarn its natural creamy white color and dye the rest. One of the best yarn producers. 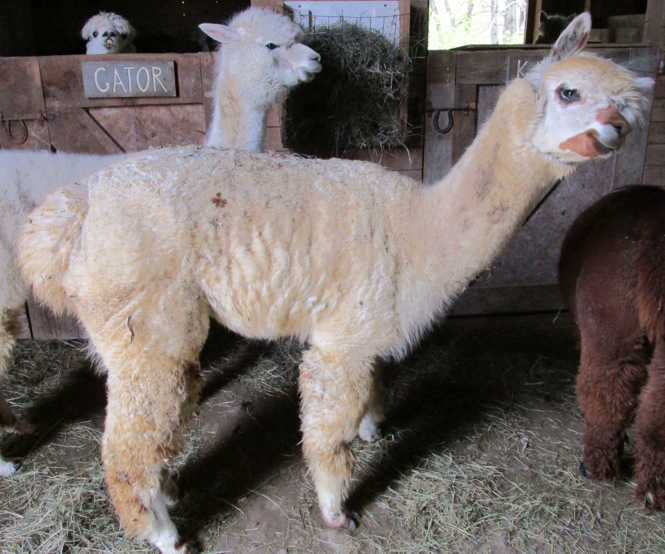 MoonDance is one of our older alpacas, but still produces very soft fiber the makes very nice, cream colored yarn. I generally combine her fleece with other fleeces of similar color and have it in stock. ‘Purp’ has the most beautiful and soft fiber that actually looks lavender. He doesn’t produce all that much, so we blend his rose gray fleece with his half brother Guns N Roses. Tupie getting her ribbon in Vermont. Tupelo Honey has medium fawn fiber that is just a shade lighter than her sire Sammy. We generally blend her fleece with Axel to make a very pretty ‘twist’ yarn or a heathered yarn that looks like tweed. Queenie has beautiful fiber that we sometimes process along with a darker animal to make heathered yarn or a twist. But we still have some of ‘totally Queenie’ yarn in stock as well. 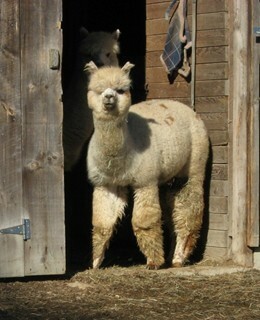 Athena was the last cria born on our farm. She was the result of an accidental breeding and we were so happy to see her brown nose and tiny spots, because we knew then that her Papa was our gorgeous Troubadour! She has grown to be a big girl, who is very bonded with her full sister Pennies and her mother Queenie. Her yarn is beautiful and quite white, as she has very few spots on her blanket area. Athena cocking her head to get a better look.